Some of you will remember a piece I wrote eight years ago for the inaugural issue of the Jewish Review of Books titled “Why There Is No Jewish Narnia.” For better and for worse, that review-essay went viral, not least because of the many vociferous critics who thought my arguments about Jews and fantasy literature were—I’ll resort to euphemism—off the mark. My editor suggested I use the piece’s fame, or infamy, to land a book contract on the topic. After all, it sparked debates that reached the New York Times (which for some reason has never happened with my scholarship on American Hebrew literature). But, at the time, I wasn’t interested in taking on such a project. That essay had really come out of my reading C. S. Lewis and J. R. R. Tolkien to my then young children and musing on what those books meant to me as a Jew. I thought I had had my say. So here’s my official announcement: I am planning to write a book on Jews and fantasy after all. And I’ll use this column in part to chronicle some of what I’ll be reading along the way. I’ll keep the deeper dives and bigger thinks on fantasy literature for longer essays, so look for those too. (We’ll see if I can convince the editor to publish three thousand words on Jewish identity in the novels of Guy Gavriel Kay.) However, don’t expect a monthly fantasy column! I reserve the right to chat with you about all of my reading, whether there be dragons or not. The protagonist of Spinning Silver is Miryem Mandelstam, the daughter of a village moneylender in Lithvas, Novik’s stand-in for Lithuania. Miryem has a knack for the family business but runs into trouble when she is kidnapped by the Staryk, a magical race that raids our world for the gold they covet. More unbelievable than any supernatural element is that the Jewish and Christian characters are friendly to the point of (sometimes literal) cuddliness. Indeed, Miryem’s rescue, and the saving of all Lithvas from an eternal winter conjured by the Staryk king, is made possible because of her friendships with the peasant girl Wanda and her brothers. In fact, Miryem’s and Wanda’s families eventually decide to live together in one big house. The book even ends with an interfaith (and interspecies) marriage between Miryem and the Staryk king. (Of course, Miryem insists they have a ceremony with a rabbi; no word yet on how they’re planning to raise the children.) Wanda and her brother Sergey sign the ketuba as witnesses. Sure, all this beats a pogrom. But given that Novik clearly intends the book to work as a commentary on the situation of Jews in the Eastern European past, the result is an unconvincing muddle. In Novik’s fairy tale, anti-Semitism (along with most other problems) seems mainly a result of economic inequity, scarcity, and greed. If people would just learn to share instead of seeking profits and hoarding wealth it would go away. But this is only remotely plausible because Novik has stocked her book not with anything resembling historical Jews and Christians but with 21st-century secular liberals who have no commitment to group identity in the first place. “I confess I had never been very attached to Torah,” says Miryem. (It doesn’t help that Novik has Miryem repeatedly cite the story of Judith and Holofernes as Jewish “color.” Novik seems not to know that the book of Judith is part of the Christian scriptural canon, not the Jewish Bible.) For that matter, none of Novik’s main characters, Jew or Christian, express any attachment to peoplehood, religion, or nation. Tellingly, Novik’s Litvaks don’t even speak Yiddish. Miryem, Wanda, and their pals (who also include a Lithuanian noblewoman and her maidservant) all share an instinctive—if, given the setting of the book, inexplicable—belief in social and gender equality. Under these circumstances, it isn’t impossible that the protagonists would adopt each other as extended family, no matter their supposed background. But the logical implication is that everyone else in this fictional world, with their silly group loyalties and nominal cultures, is, well, stupid. It may be difficult to write a compelling fairy tale about anti-Semitism—though Agnon did it brilliantly in “The Lady and the Peddler.” But the underlying assumptions of Spinning Silver made me think of the scene in Singin’ in the Rain when the movie star Lina Lamont complains about her outfit for a French Revolution costume drama. Lina: Gee, this wig weighs a ton! What dope’d wear a thing like this? Rosco: Everybody used to wear them, Lina. Lina: Well, then everybody was a dope. The girls looked beautiful, Jennie thought, with their bare breasts painted in Sun bursts and Moon phases, with stripes running down their arms to their fingertips, like rippling rivers ending in five bright tributaries. The oil on their arms (to prevent Malignant Ones fastening on to them) made the muscles flash. Jennie wished she could join them, with no worries other than remembering the “constellations.” She knew that that was what the girls called the patterns made by the striped stick with the (plastic) skull of a small bird mounted on either end. You had to get the twirls just right or else the blessing on the street would go wrong and there’d be car crashes the following weeks. It would be fun to read Unquenchable Fire alongside Harold Bloom’s The American Religion and Charles Taylor’s A Secular Age, but it is its own magnificently written concoction. Yet when I was done with the noisy, clamoring sacred of the novel and its concomitant mythorrhea, I felt, well, blessed to live in a Judeo-Christian cultural matrix rather than this shamanic one. At least our God, unlike Jennie’s spirits, has the consideration to leave us alone some of the time. Michael Weingrad is professor of Jewish studies at Portland State University. He is a frequent contributor to the Jewish Review of Books and Mosaic and is currently working on a book about Jews and fantasy literature. 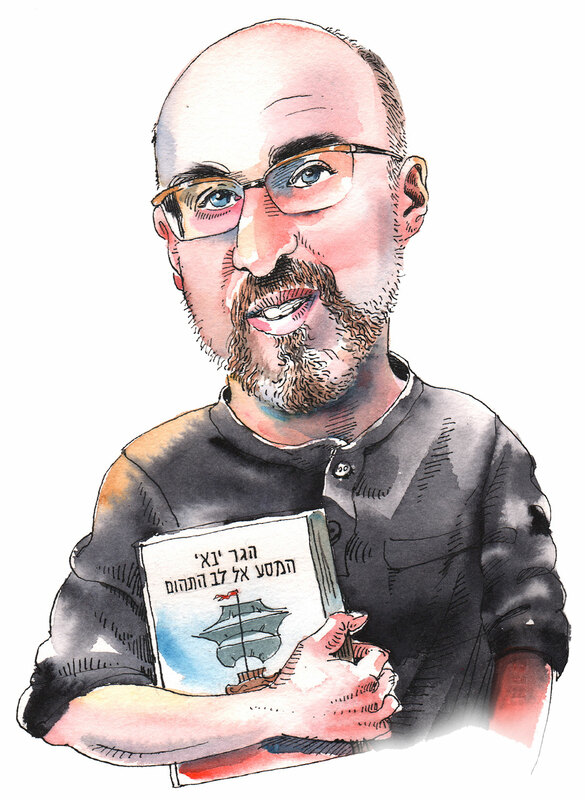 Michael Weingrad responds to readers of his essay on the dearth of Jewish fantasy literature. Two new books, different in tone but matched in caliber, show Israelis making their way as best they can in America and in life. The Yarkon is as good a site as any for pondering the relationship between Israel and the imagination.